A dental bridge fills in the gap that is due to missing teeth. The bridge usually consists of two crowns on either side of the gap. These two teeth are very important and are referred to as the abutment teeth. There are false teeth in-between called pontics. Pontics are made from a variety of substances including alloys, gold or porcelain. Pontics can also be made of the combination of those materials. Natural teeth or tooth implants are what supports dental bridges within the mouth. Dental bridges are used for a variety of reasons including restoring one’s smile and regaining the ability to speak or chew properly. Dental bridges can also prevent remaining teeth from shifting and help maintain the contours of your face. The costs of dental bridges vary greatly. The cost is influenced by the type of bridge selected, the state you are getting the procedure in and the qualifications of the dentist. The number of teeth being replaced with the bridge will also increase the cost. The average cost for most dental bridges is approximately $3,000 – $5,000. Many dental insurance companies will pay a partial or full amount of the bridge depending on the individual’s dental plan. At the first visit with your dentist you will go over the different types of bridges used. This will allow you to find out which one suits your needs best. Dental bridges consist of three different types that are most commonly used. Traditional bridges are the most common type of bridge used. They can be made up of a wide variety of materials including porcelain, ceramics, metal or a combination of these materials. These types of brides are used to create a crown on either side of the tooth or with a pontic in the middle. Dental implants may also be used instead of a patient’s own tooth. Maryland bonded bridges are also used for many dental issues. 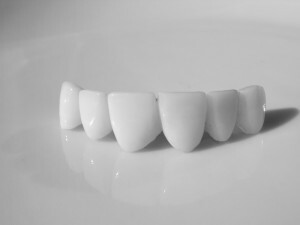 These bridges consist of a metal framework that holds plastic teeth and false gums. There are metal pieces that stick out like wings on each side of the bridge. These wings help to hold the bridge in place and are glued to your own teeth. Cantilever bridges are used to fill in gaps that are created when there are only adjacent teeth on one side of the teeth that are missing. The dentist will make room for the bridge by reshaping the teeth. This process usually involves wearing down some enamel to make room for the crown. The dentist will then generate impressions of your teeth to serve as the model for the bridge. The model will be created in a dental lab. The dentist will make a temporary bridge to protect the exposed teeth and gums. At the next visit the temporary bridge will be taken out and the permanent bridge will be installed. There is very little recovery involved with dental bridges. Some people may have to have their teeth filed down or built up in preparation for the bridge. That is usually the extent of discomfort involved. Once the bridge is in place it will take time to get used to it. Your dentist may want to see you a few weeks after you receive your bridge to ensure that it fits properly. It is important to practice healthy dental habits to ensure that your remaining teeth will be healthy and strong. There is no immediate follow-up required with dental bridges. If you notice extensive discomfort or irritation you should contact your dentist’s office for an appointment. Dental bridges last anywhere from five to fifteen years. To increase the lifespan of bridges you must practice good oral hygiene. Good oral habits include brushing, flossing and regular check-ups on a regular basis.